Books Archives - Proper Landscaping Inc.
“The Plant Messiah” book by Carlos Magdalena was a massive treat to listen to at work. It will appeal to all plant lovers, gardeners, landscapers and horticulturists. The audio version is eight hours long and it could have been longer. The Kew training period is described in some detail and I felt a bit jealous when I listened to it. 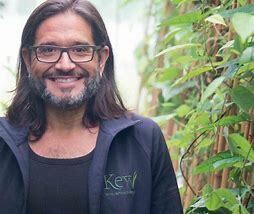 When I go to England next, I will visit Kew. Magdalena is an expert on water lilies and he describes many overseas research trips. This is fun to listen to and reminds me of the old plant explorers who would travel the globe and then send specimens to Kew. Magdalena’s love of plants is infectious. He’s a professional and it shows. Google image: I don’t own this picture. Because this book is about plants, Magdalena correctly reminds us that plants are extremely important for humans. I think it’s true that people often fail to appreciate plants. Without them we wouldn’t last long. This is Magdalena’s one serious message in an otherwise fun book. Just consider that we eat plants, we burn them for fuel, we derive pleasure and medicines from them, and we also build with them things like shelter and boats. Many people also consume them as a hobby; and they’re also used in religious rituals. Many drug lords got rich thanks to plants. Can you think of other uses? I thoroughly enjoyed the eight hour audio version of this book from Kobo. I can’t find any faults with it. It inspired me to study more about plants and to appreciate them more. And Magdalena’s enthusiasm is infectious. Five stars. Easily. This past weekend I opened up the New York Times and saw a huge spread about the best books from 2018. But there was nothing for green professionals so let’s correct that omission here. I present to you six books well-worth reading with brief notes. I would say they’re all “must read” books. Who knows, they might inspire you to give someone a great gift this Christmas. This is a very important book because Gabe Brown took his conventionally farmed land and regenerated its soils. He did it without tilling, with cover crops and eventually without all fertilizer and chemical use on his North Dakota ranch. He also diversified his operation. So, YES, you can have great, healthy soil and make great money as a farmer in North America WITHOUT chemical inputs. Read the details in the book. It’s fascinating. The key is encouraging the life in your soil. You can search “regenerative agriculture” for more. Stika is a soil scientist but it took him years to realize that his training wasn’t the best. Eventually he comes to understand that soil biology is crucial for healthy soils. 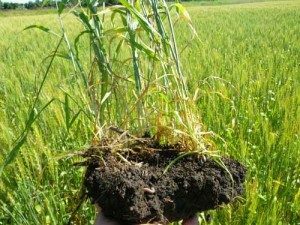 It’s not just the soil components that matter, the life in the soil is critical. Fukuoka was a “do-nothing” farming revolutionary in Japan. He showed that you CAN have great rice yields without tilling the soil and using costly fertilizers and chemicals. Do-nothing is a bit misleading because farming is a lot of work but the soil wasn’t tilled and cover crops were used. The details are amazing. It’s possible that Fukuoka’s work inspired Gabe Brown above. 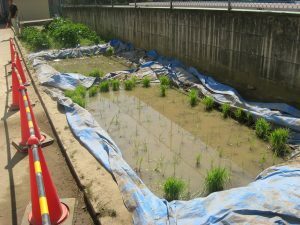 A practice rice field at a Niigata-City, Japan public school. This is THE book on native American plant use. I often hear about indigenous wisdom and this book spells it out in detail. Kimmerer did a fantastic job with this book; she opened my eyes. You will learn lots about plants. I also purchased her new book on Mosses. Two key points: One, Magdalena goes from Spain to study at the famous Royal Botanic Gardens, Kew (I’m jealous) and becomes a plant researcher there. Then he travels the world studying plants and clearly his native Spanish helped. His love of plants is infectious. Two, at the beginning of the book he shows the reader why plants are important. Our very survival depends on plants. We derive food and medicines from plants plus much more. 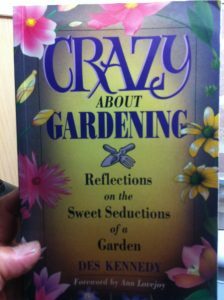 After reading this book you will appreciate plants much more. My geography professor at the University of Saskatchewan openly discouraged me from using sources written by journalists. But in the case of Monsanto’s (now Bayer) glyphosate and other chemicals it can’t be done because many scientists have been bought by industry. I know that this debate is polarizing and the book isn’t full of good news. It’s the hardest book to read on this list. Before you dismiss this book, recall that Health Canada is re-evaluating its recommendations; it now concedes that many of the studies the government agency relied on were sponsored by the chemical industry. It’s much worse in the United States and the details will make your head spin. I think this book is very important. Here are the key ideas. Yes, you can make good money as a farmer without fertilizers and chemicals; stop tilling and use cover crops; and diversify your operation. The life in your soil is the key to healthy soil. We depend on plants for our survival. They’re also amazing. Indigenous plant knowledge is fantastic and now we have a great book showing us the details. Scientists can be bought so be careful when you read scientific studies. Carefully check who sponsored them. I finally realized one of my dream projects: to self-publish an e-book for new landscapers. Since the internet has revolutionized publishing this is a great time to put your stuff out into the world. Are you not convinced yet? Then read James Altucher’s blog on self-publishing. Why publish an e-book with common strata plants? Because it’s part of my job to train new landscapers in the field. And plant identification skills are one big part of that training. After answering the same plant questions over and over, I had an idea. I realized that we could tweak it by putting the most common plant species we see on our strata complexes into one picture file. And then publishing it in electronic e-book format and making it available for download online. Repetition: Plants on our strata complexes tend to repeat and that works in our favour. Once the new worker learns to recognize shrubs like Viburnum davidii he will see them on other sites. The list: The plant list I put together comes from strata sites and represents, what I believe, is a good starting point. So just take the list and learn it. There’s no need to consult thick reference manuals or spend time making your own list. This was an important first run test because I have other projects in mind. So stay tuned by checking this blog. To read how I self-published the e-book, click here. Of course, the trick is to get new landscapers to download and flip through the e-book. I think employer incentives might help. New workers are usually busy enough with machines and bedwork. Plant knowledge comes later with experience. But let’s consider why plant ID is important. a) Bedwork or finesse work can be completed faster when you can easily distinguish between plants and unwanted weeds. I’ve seen many new landscapers paralyzed in gardens because they weren’t sure what was what. If you’re not sure, don’t pull it. Don’t panic, just get better. b) Landscape design requires exceptional plant knowledge. One day the new landscape worker might move up and pursue design work. c) Nurseries only use botanical names so if you know your plants you can easily place orders and check them for accuracy. Always keep plant tags and study them. d) Gardening, like design, depends on exceptional plant ID skills. I found this out when I apprenticed under my city gardener boss. Her plant ID knowledge was unbelievable. Eventually I found out where city gardeners make their money: in annual bed displays. The kicker is that when they meet they order new plants for next year by grouping their plant orders. You need knowledge and experience for this task. I respect all city gardeners for this. e) Clients will stop you to ask questions and if you’re ready, you will impress them with your knowledge. As Red Seal journeyman on site I inevitable get called over by workers who are happy to deflect client questions to me. Great! I always take the heat. f) One day your boss or client will take you for a site walk and ask for ideas. There won’t be time for Google searches. You have to suggest plants right there, on the spot. That can be stressful but not if you know some plants. 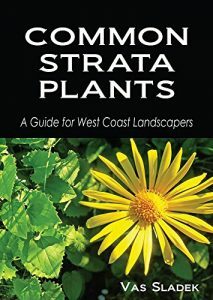 The plant picture book can be used by new landscapers as a starting point; and also by strata managers and strata unit owners who may wonder what’s growing on their sites. Knowing plant names makes communication with landscapers easier. This is a true story about green lawns and how they came to dominate in the United States. Ted Steinberg’s “American Green: the obsessive quest for the perfect lawn” is an excellent book. Steinberg is an environmental historian and it shows. 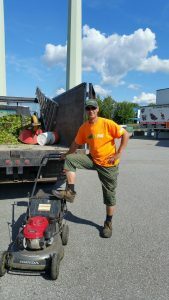 Landscapers, gardeners, and people who love or hate lawns should definitely read it. 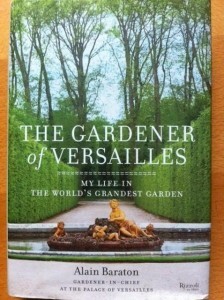 As a landscape professional I found it fascinating on my second reading. The book isn’t new. It was published in 2006. I read it and my copy ended up in storage until now. My second reading was better. I recommend buying the softcover edition for your own library. Steinberg takes you from the Origins, through the Dark Side and into the Future. With global warming and severe droughts in California, the Future chapters would look different if the second edition were to be published now in 2016. In the Origins you will meet the key characters that shaped the landscape industry and made the lawn a key feature. It really is a fascinating question: why should the lawn dominate so much? A huge industry developed around it as landscape turned into landscaping. A father and son would share the lawn care work around their home but eventually a new industry rose up to do the work for them. Fertilizer and pesticide use went up and soon a debate started. Lawn lovers versus detractors. 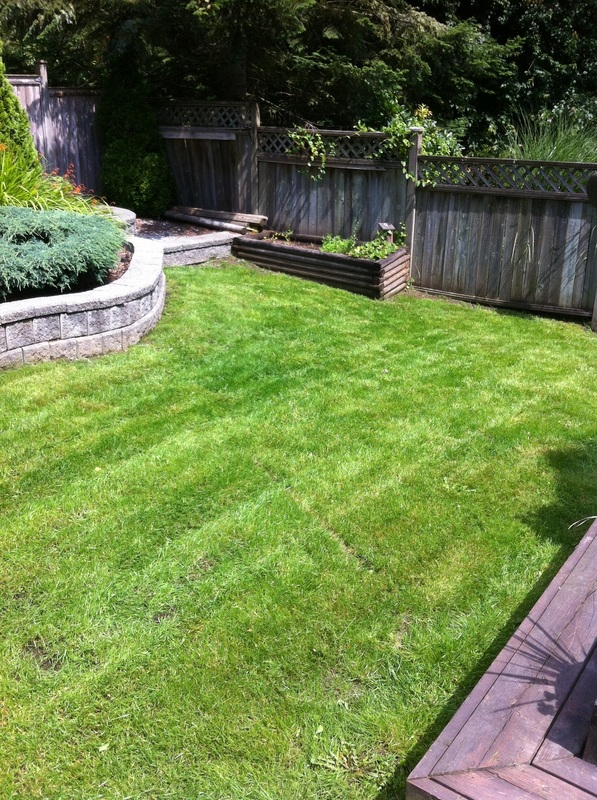 This client loves his lawns…. The case for brown lawns now makes a lot of sense. 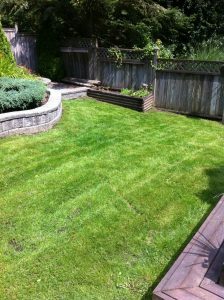 With water restrictions in the US and Canada, it makes sense to let lawns go dormant in summer. Unless you are rich and living in a place where brown can’t happen. But that will be the subject of a future blog post based on a recent Harper’s magazine story from California. You can dive deep into this subject if you follow Steinberg’s notes. I looked up an interesting story from 1983. It was a case where a wife in Massachusetts wanted to surprise her husband with a beautiful lawn. She hired a company but managed to catch a worker urinating on her property. When she confronted him, he assaulted her, choked and strangled her and eventually crushed her skull with pieces from a retaining wall. Defence lawyers argued that repeated exposure to chemicals made the 23 year old worker unable to decide between right and wrong. The jury disagreed. First degree murder charge carried an automatic life sentence for the recent college graduate. A sad and bizarre story. If you work in the green industry, this is one must-read book. Likewise if you love or hate lawns. Five stars out of five. 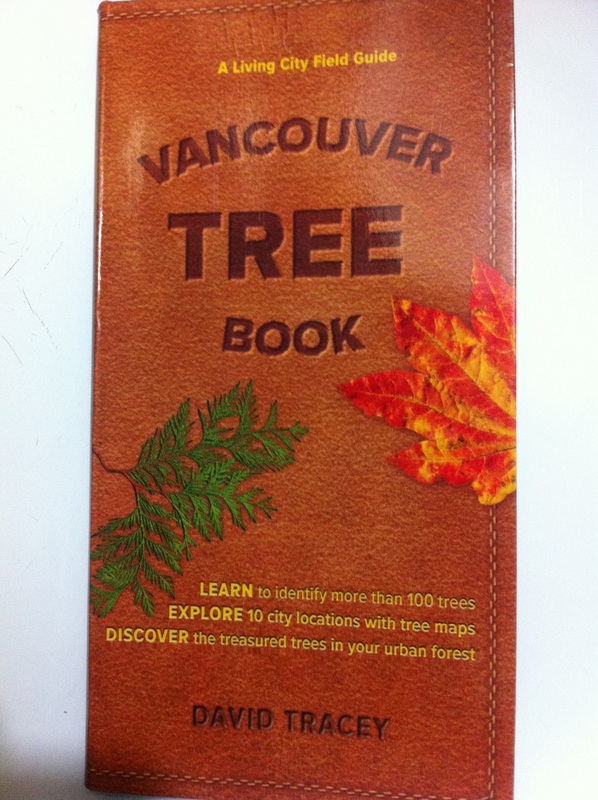 Vancouver Tree Book by David Tracey is now available in bookstores. Normally I would wait for Amazon to ship the book but I didn’t want to wait. Not for a new tree book. I picked it up from Chapter’s for $21, tax included. Not bad. It’s pocket-sized and features 100 trees. It will easily slip into your backpack. One nice touch is that we are given actual City of Vancouver spots where the trees can be seen. There is also a list of 10 treasured trees in the city. The illustrations are very nice. Since this is a pocket guide, only basic information is presented. After scanning the guide, it’s clear I still have some work left to do on my tree identification skills. Not to worry. I will get there. I’m an arborist just like Tracey. Having discovered Acer campestre in Langley and nowhere else, I was relieved to find out that there are plenty of specimens in Vancouver. 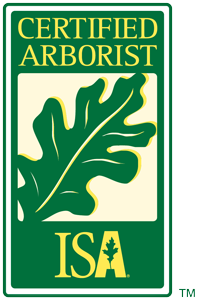 My favorite tree, Albizia julibrissin is also in the guide, which means the guide automatically gets a passing grade. 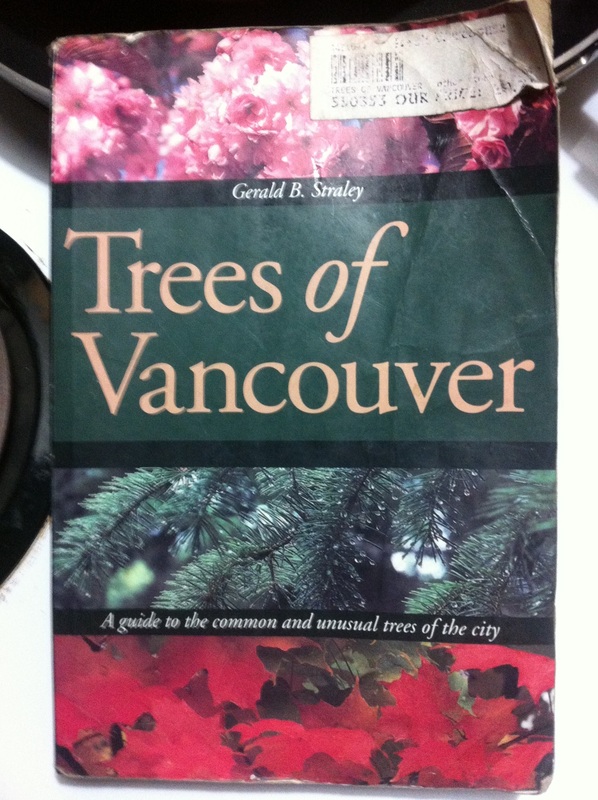 The guide makes references to an earlier book on Vancouver Trees. Trees of Vancouver by Gerald B. Straley we learn is now out of print (I have a copy!) . Sadly, the author has passed away. That makes my copy that much more precious. 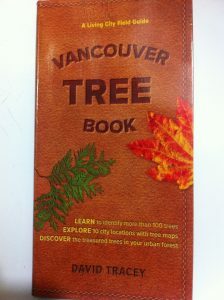 Unlike Tracey’s pocket guide, this is a bigger book that covers over 470 trees and includes leaf drawings. In the middle are 86 beautiful color photographs. Location information is also given which makes it easy for you to locate your favorite species. Tracey obviously copied this handy approach. This is a handy guide for all green professionals. It’s well worth $21. I will now go through it and scan it for the species I don’t yet know well. I hope you do the same. Sometimes you get lucky. Sometimes. Walking back to my car after returning bottles for deposit, I noticed a used bookshop sign. Closing, Final day, 70% off all used books. Aha. A very pleasant detour on my way to discovering Des Kennedy. Half an hour later I walked out with the BC garden writer’s book. At $1.30 it was a steal. Kennedy is an award-winning writer and it shows. “Crazy about gardening” is a funny book. It’s subtitled “Reflections on the sweet seductions of a garden“. So we know this isn’t a technical manual. The lessons are subtle, mixed in with jokes and stories. If you let him, Kennedy has plenty to teach you. Life’s a short summer, man a flower. He dies-alas! how soon he dies. Obviously, just like stand-up comedy, your enjoyment is directly related to your age and experience. If you are an experienced gardener, you will definitely be entertained. If you are new to gardening, read and learn. Your vocabulary will also improve. Kennedy hires a water diviner to find water on his property. A water witch. I find this fascinating because my own grandfather did this with outrageous accuracy just outside Prague. As a little city kid, visiting the country, I found it amazing. Grandpa would pick a branch, slice one end in half, grab one end with each hand and walk. Once he hit water, the top uncut end of the branch would dip down towards the ground. Success. Grandpa also made money by digging wells. The hard way. Dog days droop. Kennedy makes fun of the late summer period when what was beautiful is all of a sudden dreary and desiccated. Pests multiply. April energy is long gone. The gardener temporarily loses grip. Lawns. We know they use water, fertilizers, herbicides, and require time and effort to maintain. It’s a bizarre fetish. Once the lawn is nicely cut Kennedy admits to feeling a “bizarre little thrill of satisfaction, of emotional well-being.” I concur. There is something to this. At $1.30 this book was a steal. Des Kennedy is worth whatever Amazon charges for his books. Give him a try. 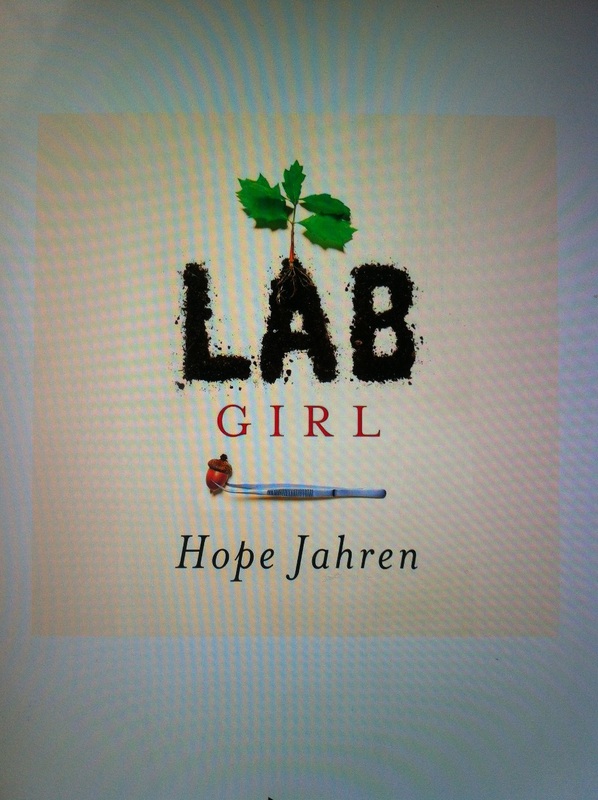 “LAB GIRL” by Dr. Hope Jahren is a fantastic book! That is, if you like plants, science or you are considering a career in academia. I purchased the audio version and listened to the book during my weekend work sessions. Dr. Jahren’s Ph.D. dissertation was about a tree. Her work focuses on plants and their longevity. Paleobiology. The chapters nicely alternate between personal life and science. I openly confess to enjoying the science chapters more. It seemed like there were too many lab set-up references. But this connects to Dr. Jahren’s constant side-kick, lab researcher Bill. The two are inseparable. After finishing the book you might feel the urge to visit with Bill. He is a pretty interesting character. Key idea 1: If you want to make it in academia as a female Ph.D., get ready for a bumpy ride. Male professors have doubts, funding and grants are a constant headache. This book should be required reading for any female considering a career in US academia. Key idea 2: Plants, especially trees, are incredibly fascinating. I already knew that. You will, too, after reading “Lab girl”. Consider the case of resurrection plants. They are so brown and dry, we would consider them dead, and toss them. But wait. A bit of moisture brings them back to life. This can repeat many, many times, until eventually they do die. These are the only plants that have figured out how to grow without being green! Seeds are also amazing. Alive, they can wait for hundreds of years before taking a chance and emerging. Their one chance. What exactly triggers it? Key idea 3: The book closes with a personal request from the author to plant a tree at your home. If you can. The planet is losing green cover every year. This small act of planting a tree or two will help. Key idea 4: To learn more about trees, Dr. Jahren recommends Peter A. Thomas’ “Trees: Their Natural History“, about $50 from Amazon.ca. By the time this blog post is published, I expect to have it finished. In paperback form. The book has a happy ending. Hope marries, has a child and the family settles in Hawaii. So does Bill. Of course. I love plants so I give it 5 stars out of 5. 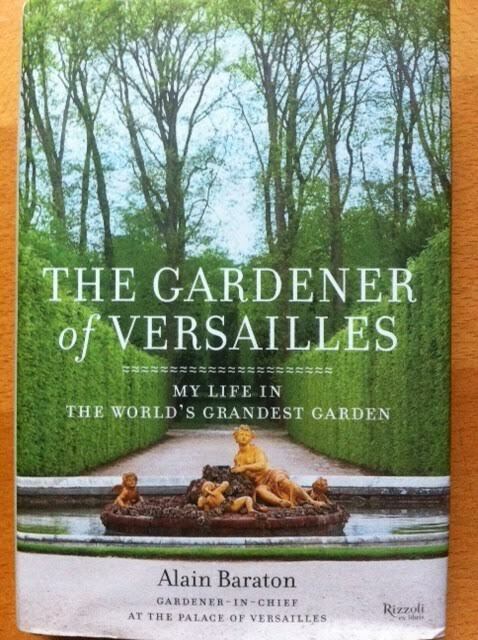 This French best seller, written by Alain Baraton, gardener-in-chief at the palace of Versaille, is fantastic! It will appeal to all gardeners and green professionals. Baraton offers us an intimate look at his career path and the history of the famous grounds. His job is not easy. Working under him are eighty gardeners, and they manage 350,000 trees, flowers and plants, plus thirty miles of walkways on 2,100 acres of land. No more enthusiastic amateurs; all new gardeners are required to pass standard government exams. The gardens have been frequented and loved by kings and queens. Baraton includes many paragraphs on young French kings and their many escapades. Versaille is frequented by lovers looking for secluded spots and this leads us to an interesting quote: “A garden capable of attracting lovers is a success”. Totally unexpected were the hordes of grandmothers making secret cuttings to take back home. I was personally fascinated with the details of a gardener’s life and the many great gardeners who worked on the grounds before Baraton. If you like French history or just good stories, you won’t be disappointed. The absolute best story, well worth the price of the book, is that of Louis XIV and his new Superintendent of Finances, Fouquet. Fouquet created an amazing garden at the chateau Vaux-le-Vicomte and threw the party of all parties. Some guests received horses as door prizes! In one account, the young king Louis XIV got very jealous and poor Fouquet was stripped of all of his possessions. Court judges wanted him exiled but that was too mellow for the young king. He threw Fouquet into prison and he died there! Another account says Fouquet was set up. It was his predecessor who abused the treasury. I highly recommend this book. Five stars. 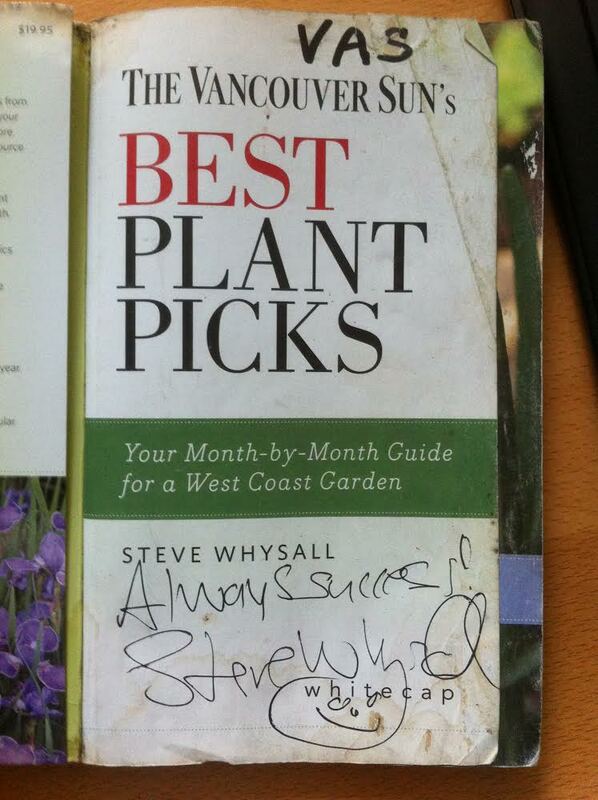 Follow local gardening guru Steve Whysall and learn! Imagine my excitement last year when I discovered that my kids were having play-dates with Steve Whysall’s grandkids! 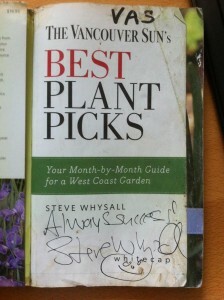 Mr. Whysall has been writing about gardening for the Vancouver Sun since 1994. Look for his column on Fridays, usually on page C3. You are guaranteed to learn new things. I often rip out the section and file it. 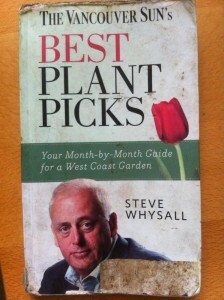 Mr. Whysall has also published several books and organizes overseas garden tours. While the tours are attractive they are way over my family budget. I am, however, ready to plug what I consider to be his most useful book. Best plant picks, slightly beat up and autographed, has served me really well. The book is a neat month by month guide for our West Coast gardens. I use it to practice plant identification and to review the list of garden tasks to be performed on a particular month. As the seasons pile up, I can run through the list of plants much quicker. Always learn about new plants and review them. 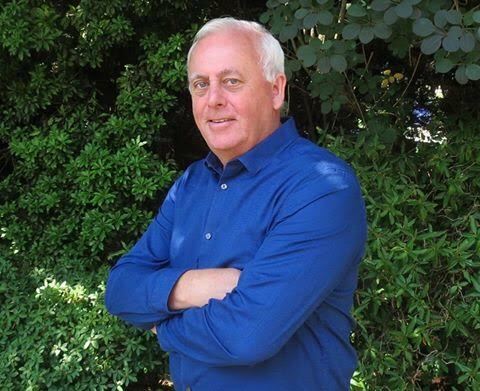 For more information visit www.stevewhysall.com. It is my humble opinion that the website could use an upgrade but it is still useful. If your family budget allows, please subscribe to the Vancouver Sun newspaper at www.vancouversun.com.